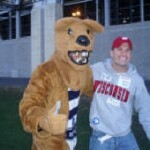 Friendliness comes to mind when mentioning Penn State and Beaver Stadium. 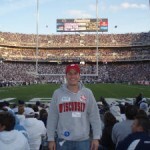 Happy Valley is a joyous place for the home team, and outside of a few conference rivals, it’s a welcoming spot for visiting fans, as well. Perhaps it’s because Nittany Lion fans know that wherever these fans came from, they must have traveled a tremendous distance. University Park, Pennsylvania is hidden in a valley amongst the Allegheny Mountains and the famous Mount Nittany. Lion fans arrive days before kickoff parking their RVs in the many open grass lots around the 100,000+ seat arena. 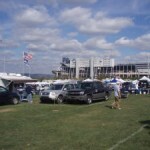 Tailgating at Penn State is tops in the Big Ten conference. Fans start early and celebrate late. 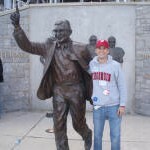 Penn State legend, Joe Paterno, helped transform Nittany Lion football into a winning tradition and a place where all college football fans should visit. 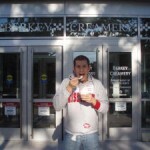 The late coach even has his own Ice Cream at the Berkey Creamery, a hotspot on campus prior to the game. Folks fill up on Peachy Paterno and enjoy the beautiful campus surroundings. 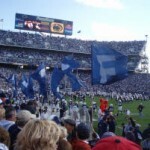 Penn State University really is its own community, and the folks soak in every corner of campus prior to the game. 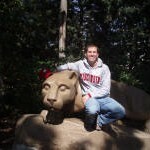 Another hotspot is the Lion Shrine, where the class of 1940 donated the now famous Nittany Lion statue. Fans wanting a photo with the lion should plan ahead as the line to get a picture can stretch to an hour long. 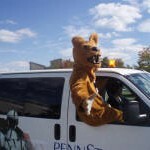 The team’s arrival has maintained a classic nature as a parade of Penn State blue painted school buses swing around toward Beaver Stadium a couple hours before kickoff. 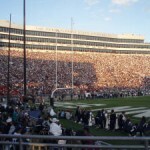 A massive crowd of Nittany Lion faithful gather in anticipation of greeting their team as they unload from their unconventional coaches. The stadium itself is an architectural wonder from the outside. From many angles, you can see the dense inner workings of steel beneath like a complex erector set project. The inside is imposing as the large bowl is enhanced by giant upper decks that stretch toward the clouds. The Blue Band kicks off the festivities by ripping off “Fight On State” and the Nittany Lions charge through swinging gates. If you are fortunate enough to attend during a “white out” game, you will see it executed like no other stadium in the country. 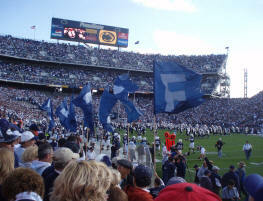 The crowd is deafening, especially when one end screams “WE ARE” followed by “PENN STATE!” echoed from the opposite side. The fans at Beaver Stadium are the definition of devotion. 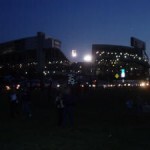 Penn State could be the poster child for college football with its behemoth stadium lost in the middle of a gorgeous Pennsylvania landscape and surrounded by rabid fans harboring a proud tradition.